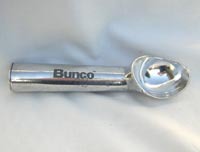 Bunco Ice Cream scoop for your Bunco Night will be a sure winner. Be party supplies, gift or accessorie, or a novelties item ... try this for that OH what a wonderful gift for the Bunco World enthusiast. When you share the Bunco scoop with the Bunco Coffee homemade Ice Cream your Bunco Group and guest will be sure to remember the BuncFun occasion as a delightful treat. Oh, a novelty of homemade Ice Cream or simply the favorite blend for your friends, both will be enjoyed served with this special Bunco Ice Cream Scoop etched with Bunco and the three dice ... from the catalog so hurry and order while they last. Add cooled coffee, whipping cream and salt. Place in Electric or hand operated freezer. or flavored coffee. ( You may omit the Kahlua ... instead use Bunco Flavored Coffee).